Home › Home News › A wonderful celebration of music, faith & community! 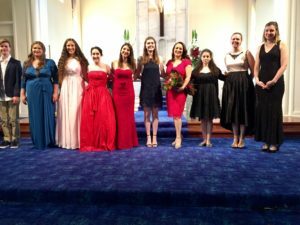 Sydney Sings with Amelia Farrugia was a wonderful celebration of music, faith and community on Saturday 10th December. So many people from the local Blessed Sacrament community and quite a number from a-far enjoyed the strength and beauty of Amelia Farrugia, renowned Australian Opera performer alongside her beautiful students whose emotional, entertaining and heartfelt performances truly uplifted the faces of those sitting in the audience. The music could be heard from all around the outside of the Chapel and gave the opportunity for a whole community to enjoy a moment of joy during a very busy lead-up to Christmas. Thank you to those who came and enjoyed the concert, to Amelia and the students – our heartfelt thanks, especially from the children in Timor-Leste who will be benefiting furthermore by the sharing from the Concert. An enormous thank you also to Theresa at the Parish Office for your support in this initiative. We hope to be able to share the beauty of music with you all again next year! To find out more about the Music for Life Program Click Here. To donate this Christmas to the work in Timor-Leste Click Here. Thank you for keeping the work of Mary MacKillop in your prayers. To offer a prayer for Christmas Click Here.